We are located directly across the street from Cincinnati Children’s. Please review the parking instructions here prior to your arrival. Thank you! To drop off a donation, or to load/unload your vehicle, follow the signs to the Donation Drop Off area, located on the former Erkenbrecher Avenue. While signs say the road is closed, there is access to our House. Use the call box at our Visitor Entrance to contact our front desk. Once the gate opens, please park in one of the marked spaces in front of our West Wing (see area marked in red on map below). Due to the limited number of spaces, parking in this area is limited to 30 minutes. 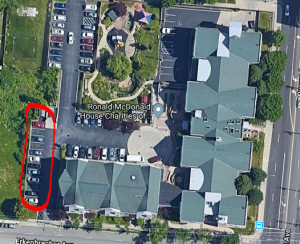 For Taste of Hope volunteers or others visiting our House for longer than 30 minutes, please park across the street from our House in Cincinnati Children’s Northern Avenue parking garage. Parking is free in this garage and you can cross the street and enter through our Burnet Ave. entrance. Additional parking is available in Cincinnati Children’s Visitor parking garage under the main campus. It is free at night (6 p.m. to 7 a.m.) and on weekends and holidays. It is $3 per vehicle to park there all other hours. School buses should let students out at our entrance door and park outside our gates. PLEASE NOTE: Due to construction work, there is very limited parking for buses around the perimeter of our House. We recommend carpooling if possible.